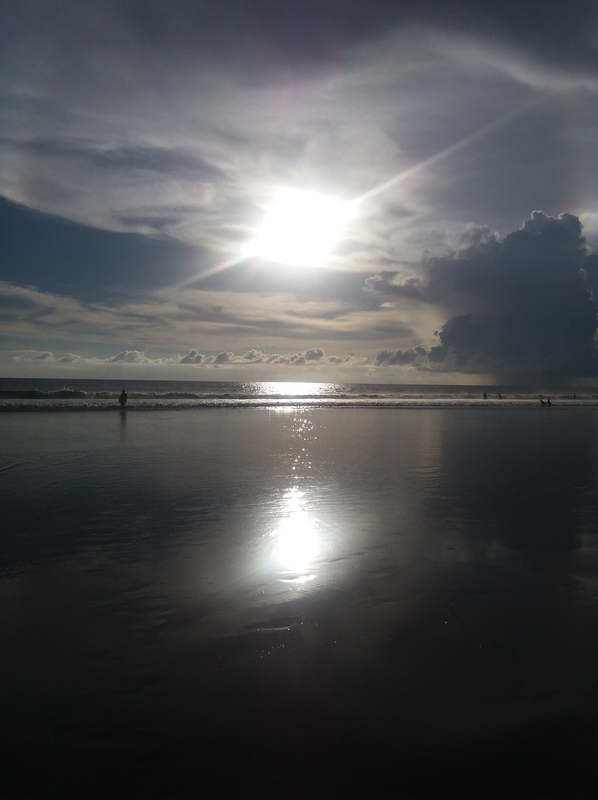 I am surrounded by amazing landscapes here in Bali, everywhere I turn, there is another breathtaking view. From amazing white sand beaches to the mountains and rice fields, we really are spoilt for choice. This is the view as I was driving up to Bedugul for the day.The agricultural fields in the foreground are framed by the mountains in the distance. 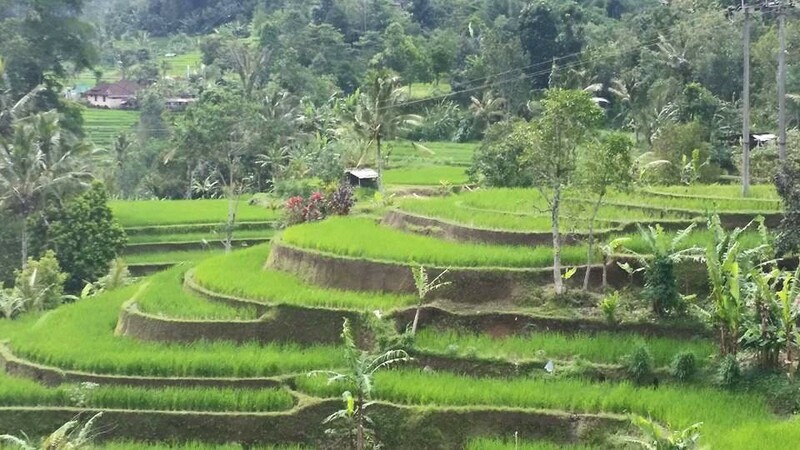 Bali is well known for its terraced rice fields, they are absolutely fascinating, in that they are so well constructed, to ensure that every single patch is able to access water. At times, the city water system is redirected to these fields in order to make sure the rice will grow undeterred. Unfortunately, more and more rice fields are being sold off to make way for new buildings. It is so short sighted as there is now not enough rice being grown in Bali to feed the people here, and rice is having to be imported in. One of the many things I fell in love with in Bali is the amazing architecture here. Sitting on the bus driving from Java to Bali, I was struck by the attention to detail in every aspect. The roofs of simple houses all had little details on the edges, the doors are intricately carved, and the temples are works of art. Here are just a few images, although I could add so many more. 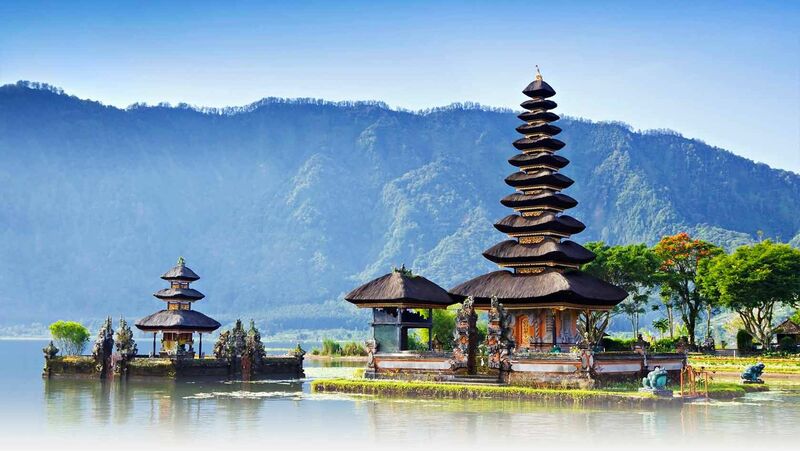 Bali is such a colorful place, it is almost impossible to isolate just one color. I did my best, but it seems a shame to leave the other colors out!! 1.The weather: It is sunny every single day of the year, and I love it! I can wear sun dresses and flip flops all the time, and never feel cold. Coming from England, this is a very big deal! 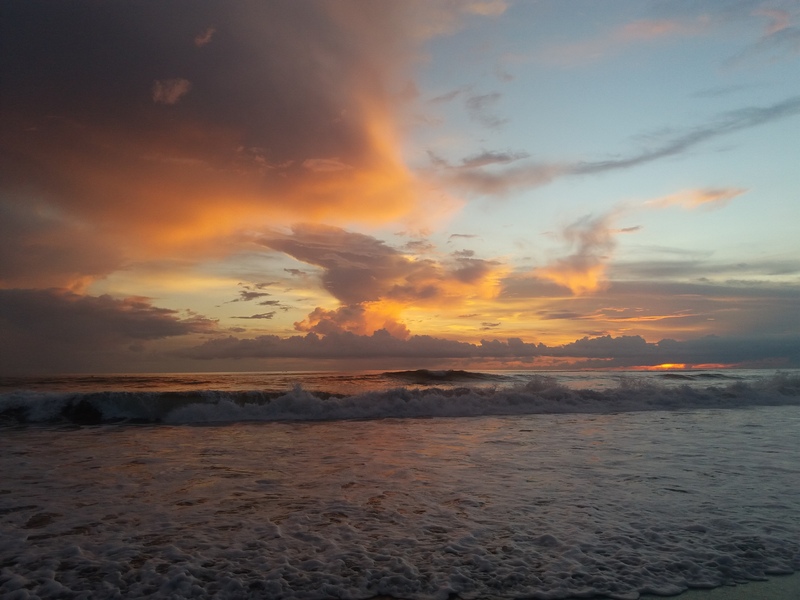 2.The beaches: The beaches here are some of the most beautiful beaches I have seen. I love the ocean, and can lose myself for hours just gazing out to sea. 8. The food: the Balinese food is so full of flavor, and so nose streamingly spicy!! Kerobokan jail is notorious world wide, and has been the focus of a great deal of attention over the years. It sits on prime real estate just outside the tourist areas, and is home to over 1000 inmates, even though it was originally built to house only 300. The conditions are cramped and squalid, at least they were when I went to visit a couple of years ago. Since then, there has been some revamping, so perhaps things are better now. This jail has housed some big household names, such as Schapelle Corby and the Bali nine, and tourists have been known to come on “tours” of the facility. Of course, the jail does not actually put on tours, but somehow these “fans” are able to get in. Why they would want to is beyond me. I did find myself visiting the jail a couple of years ago. My husband and I were informed that one of our friends had been arrested and was currently being held in Kerobokan jail. His crime? Gambling. The Balinese culture includes several forms of gambling, such as cockfighting and card playing. It is all pretty harmless, and acceptable in the culture. However, Indonesian law comes down hard on gambling, and so this friend had to do his time. We felt as we lived so close, we should go and visit. We were also intrigued about this infamous jail, and interested to see what it was like inside. There is a long and drawn out process involved in going to visit, and we had a long wait outside before we were allowed in. We went through protocol after protocol, I have forgotten how many doors and searches there were, but it was a lot. I chatted to other visitors, and mostly they were relatives of inmates, and the crimes committed ranged from gambling to drugs. Once through the final door, it was surprisingly free for all. Our inmate friend met us, and led us through a room that was full to capacity. There were people everywhere. Every piece of floor space was covered, people were sitting on top of each other, kissing, making out, chatting etc. There was food strewn everywhere. It was a mess. We had to pick our way through the bodies to the other side of the room. I was already feeling uncomfortable. It was impossible to tell who were the visitors and who were the inmates. Our inmate friend had obviously worked out how to play the system, and had arranged for a private room for our visit. It was a relief to get inside the room, away from all the crowds. He had a fellow inmate guarding the door while we sat and talked, and another brought us food and drinks. As with any institution there is a system of hierarchies, and our friend was pretty near the top. I got a little bored with the conversation, and decided to wander back in to the crowded room, and out to the fence outside, that separated the visiting room with the rest of the jail. Here, I could get a glimpse of the rest of the facility. I could see the tennis courts and garden area. It looked quite pleasant. Inmates were wandering around outside the fence, and I chatted to a couple of guys. One was a westerner who seemed (or pretended) to not understand why he was there, another an old Indonesian guy that was in for receiving stolen goods. All pretty petty crimes considering the place they were being held. I also got a look in to the Maximum security building, where there was a big western guy, sitting, looking out at me. He had a real mean look in his eyes, and I felt very uneasy. I made my way back to our private room, and was relieved when my husband announced we were leaving. We had to wait by the locked doors, for the guards to come and let us out. While we were waiting, a fight broke out between one of the inmates and the guards, and came scarily close to where we were standing. I grabbed my husband, and prayed that we would be let out quickly. As soon as the guard came, I rushed at the door, dragging my husband with me. As we piled out of the jail, I was sweating profusely, and my heart was beating so fast, I felt I was going to collapse. I have never been so scared in my life, and I never ever want to experience that again. Its a terrifying place, and I am not surprised certain inmates suffer psychologically in there. I was there for about an hour, and it has left a lasting impression on me. Every day since, I thank my lucky stars that I am a free citizen that does not have to live that kind of nightmare day after day.